B&W image of Dr. Lloyd Thompson and Dr. D. L. Jelden working on a computer. Behind them are some tape reels and a signal generator. 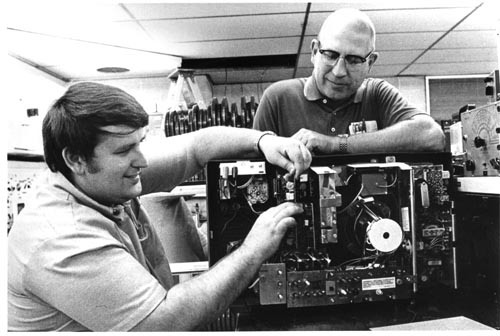 Left: Dr. Lloyd Thompson, builder of the first time/share microcomputer dedicated to CAI using 4 interactive terminals. Right Dr. D.L. Jelden, Developer of the LCES System and software CAI program model using CP\M Dos. (ISSCAI w/Gary)"